I have been making catchall trays for only about 2 months now. Since then I have made over 200 trays with “custom” engraving, many different sizes and another 80 that were ordered with one of my already engraving designs. Above is my “I love you” catchall tray, this one is 6″ X 6″ square and 5/8″ inside. I originally made this one for a shop in Blowing Rock, NC but it has become very popular. The above tray was a custom engraving order, they wanted a 3D heart in the middle with engraving on the heart. I have also engraved monogram letters on the heart for others. I recently started making Catchall trays. Each tray I handcraft from a solid piece of walnut. They have beautifully rounded corners, sanded perfectly smooth and then the bottom is engraved with various designs. My wife using one to keep her watch and rings in everyday. The catchall trays are great for holding small items such as glasses, watches, rings, earrings, thumb drives, car keys, coins, cell phone & charger, paperclips, thumbtacks, etc., the list is endless. It keeps all those everyday handy items within reach. They make great gifts! The pineapple engraving takes a long time to do but this one is very popular along with the engraved honey bees!! The trays are 8″ long and 4″ wide and I currently only make them using solid walnut. I can also engrave the bottom surface with a special message! The above Catchall tray has a carved bottom. The tray with Live, Laugh, Love was a custom engraved, special order for a customer that was a gift to a friend. Now that I have this one set-up I can easily repeat this engraving. I am working on a larger size catchall tray for another customer, so if you would like a custom size or shape please let me know. I currently have the following engravings but can do custom engraving. Winter returned with an inch of snow for us. Temperatures around 28 degrees with 15 mile an hour winds made it seem a lot colder! I took these pictures from our deck. The birds are all around the bird feeders. There were a bunch of turkey in the yard but by the time I got the camera they had gone into the woods. I have started making my Honey Sticks again in Walnut and Cherry wood. New design plus engraving. The holes are honey cone shaped and adding engraving makes them unique and special. I can also do custom engraving for you if you like! These Honey Sticks work great for dipping honey! It’s been awhile since I last posted, I hope to have more time to start posting again! Made a few Black Walnut Hand Mirrors, hope you like them! Since New Year’s I have not spent much time in the shop which has given me some time to think about my work and how precious and valuable our time is. Above; all of these were handcrafted with the combination of Black Ash Eye Burl, Padauk and Black Veneer. I want to share a few pictures of the wine bottle stoppers I have turned. Each one is unique but the design is similar. Close up picture showing the burl wood grain and the recessed cork. The above two I made using Maple Burl and blue dyed Busheye Burl. I wanted to see how the blue dyed Buckeye Burl would look when finished. The above picture is an African Blackwood, Padauk and Holly wine bottle stopper in progress of being turned on my lathe. Below, a few pictures showing my Wine Bottle Stoppers being finished on the lathe. above, handcrafted wine bottle stopper in progress on the lathe. Stabilized Box Elder Burl dyed teal. 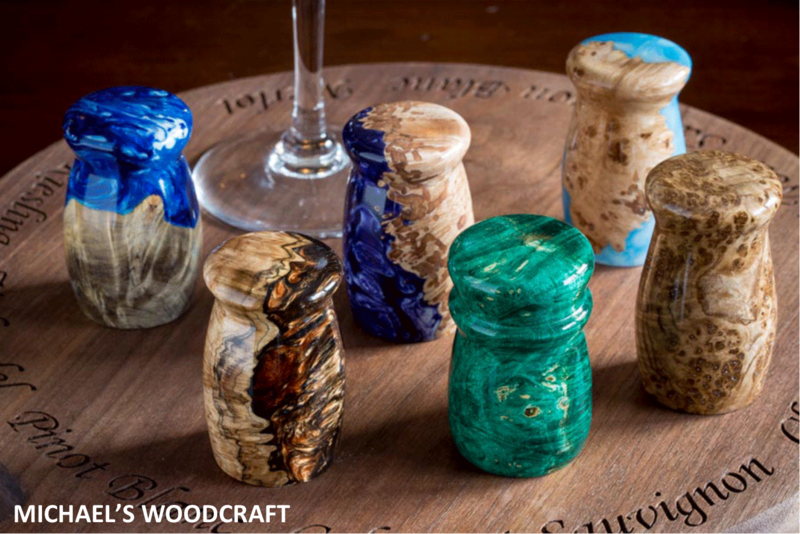 More unique wine bottle stoppers coming soon! Be sure to check out my cutting boards! If you enjoy French Toast, you will like this easy overnight recipe. Arrange the bread cubes in a lightly greased 9 x 13 baking dish. Cover with plastic wrap and place in the fridge 6 to 36 hours. Heat oven to 350 degree F. Remove plastic wrap and the loosely cover with aluminum foil. Bake for 45 to 50 minutes depending on your oven. We like our French Toast a little brown on top so after baking I will place under the broiler for 2-3 minutes. Baste with the melted butter and sprinkle with confectioners sugar. Return to over for 5 minutes. Easy recipe, I hope you give this one a try even if you don’t like French Toast! Black Walnut and Maple end grain board.